The one thing that drove me crazy about my new laptop, the Acer Aspire AS1410, was that the black plastic cover was always covered in fingerprints. You could not pick up the thing without fingerprinting it. 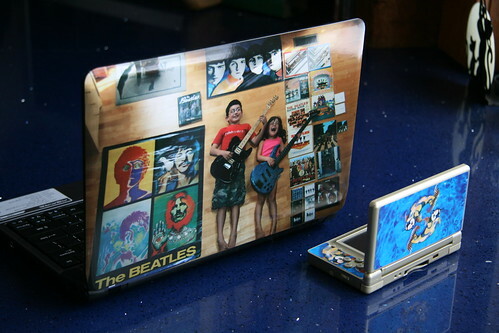 So as another Merry Christmas/Happy Birthday present to me, I made a custom SkinIt from our Beatlemania photo. After very, very carefully applying the skin (an automobile-grade decal), I now have the coolest looking laptop that doesn't fingerprint! And since I used RetailMeNot to score a nice discount, I used the extra savings to get a skin for my Nintendo DS as well. Koi Yin Yang on Blue is so very Angela. I’m usually not into customizing my gadgets, but these skins put a smile on my face. That's so cool! I will have to check them out. I always like seeing what others chose for their electronic skins. I really should have invested in one for my MacBook when I first bought it. I now have scratches everywhere. I love my Gmask Skin for my Macbook more. I've tried Skinit, and it could not cover the edge and corner and the protection is limited. But Gmask do.